Strata Planter perfectly blends the best in storage and filing features with a modern design aesthetic. Planter boxes are the modern way of bringing the benefits of living nature into a working environment. Significant benefits can be gained through increased productivity and wellbeing, as plants improve air quality and add a sense of balance. 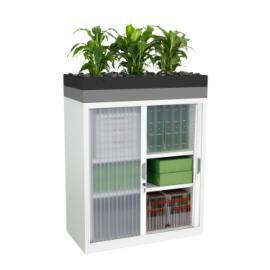 The Strata product range includes a planter box system called Strata Planter which, when integrated with Precisions Smartstore® cabinet, merges the benefits of greenscaping with the performance of cleverly designed storage spaces.